Did you know? We are 100% Canadian. Eh! We’re less than two weeks away from Canada Day and we can’t help but already be excited about celebrating being Canadian with all of our friends and family! As we grow each year and open more stores across Canada, we feel privileged to work with so many great communities nation-wide. From Victoria, BC to St John’s, NL and everywhere in-between, we love meeting you, our fans, and helping make your Halloween the best it can be. So for the next two weeks, we’re reaching out to our fans on our Facebook page, Twitter and Instagram and asking what makes YOU proud to be Canadian in your city. 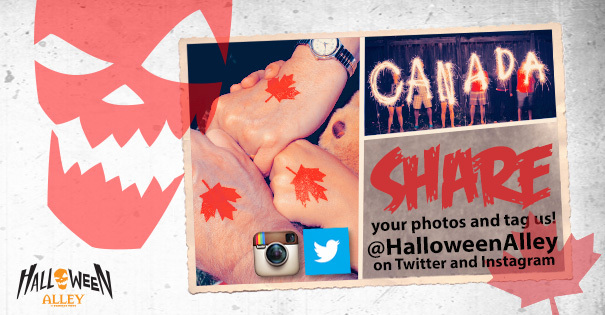 Tag your favourite photos @halloweenalley and we’ll feature the best submissions. With Halloween 2014 coming fast, we’re ramping up our selection and adding many new men’s and women’s Halloween costumes and accessories, as well as children’s costumes for our youngest fans. You are also going to be proud of our props collection! Tons of NEW stuff is coming! Can’t wait to share! Stay connected on our social media channels for previews of what we’ll have in store and remember to keep celebrating life, Halloween (and Canadian) style! Lastly, if you or anyone you know are interested in turning your passion for Canada and Halloween into another great new Halloween Alley location, check out about our Dealer Program and help bring Halloween Alley to YOUR city. Canadians who have scared all of us!